Here are some tips on How to Soothe Sore Throats this cold season! Few ailments cause overall unhappiness to both kids and parents like a sore throat. Whether it’s allergies, a cough or a cold, a sore throat is painful. When it came to sore throats, mom of four and health coach, Melissa Evans couldn’t find anything to “eez” her kids’ throats or her mind. Thus, the idea for Lolleez™ was born. 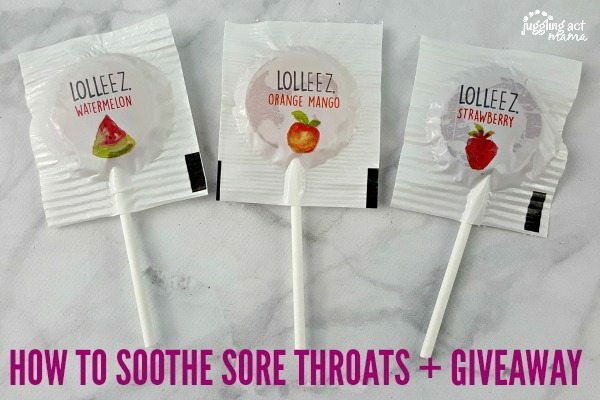 Lolleez™ are organic, worry-free, throat soothing lollipops for kids, that offer a simple solution to a simple problem. “Every time you swallow, it’s there and it hurts,” said Melissa Evans, Lolleez™ Founder. “There is nothing worse than watching your child suffer, so I’m really excited to be able to offer an organic and worry-free throat remedy that can help soothe both physical (child) and emotional (parent) pain, with the launch of Lolleez™. Here are some ideas on how to soothe sore throats. Please keep in mind that I am not a physician. No information on this site should be used to diagnose, treat, prevent or cure any disease or condition. Please always use common sense and consult your child’s pediatrician if you have a question. Growing up, my parents would give me hot water and honey for a sore throat, and they were onto something because experts say hot liquids may help decrease throat irritation. Use a cool mist humidifier in your child’s bedroom and other areas of your home, which can make your child m ore comfortable by soothing the swollen air passages. Stay hydrated – Fluids may help thin secretions and soothe an irritated throat, but stay away from juices with a lot of acid as those will irritate your child’s throat. Gargle with salt water – this may be difficult for small children, so use your best judgement. Older children can gargle using a mixture of 8oz warm water and 1 teaspoon table salt. 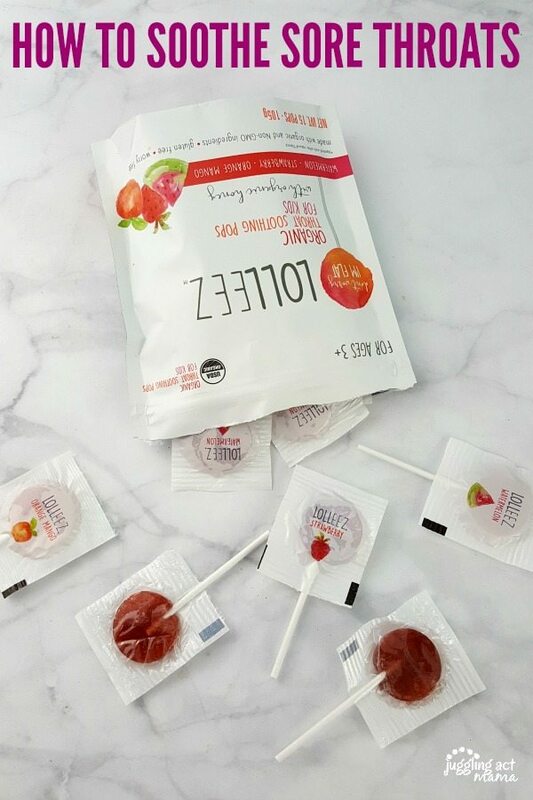 Use Lolleez Organic Throat Soothing Pops For Kids with Organic Honey, which are made from USDA Certified Organic ingredients and ingredients you can pronounce and understand, like natural fruit pectin and organic honey. They are also Non-GMO as well as gluten, dairy and nut free. Lolleez™ are now available at CVS, Stop & Shop, and on Amazon and will be available in November at Babies ‘R’ Us. Lolleez™ come in packs of 15 pops: Watermelon, Strawberry, Orange Mango and a Variety Pack for a suggested retail price of $6.99. For more information about Lolleez™, please visit www.lolleez.com. I love using my Amazon Prime membership to stock up on things I need, and avoid the stores during this busy time of year. 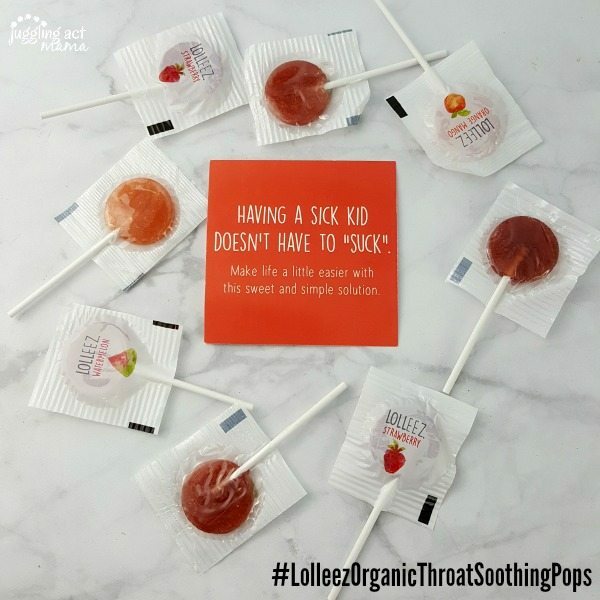 You can order Lolleez Organic Throat Soothing Pops For Kids with Organic Honey from Amazon and have them delivered right to your door! I like Lolleez Organic Throat Soothing Pops because the organic ingredients just make sense to me! Second, it’s the worry-free shape – Lolleez™ are flat and on a stick versus a round ball, which is a potential choking hazard. My children are a little older now, but for my sweet little nieces, I’d want something I know is safe for them. Of course, you should always supervise your child with Lolleez pops. Lastly, it’s the flavors – Lolleez™ comes in three delicious kid (and adult) friendly flavors: Watermelon, Strawberry and Orange Mango. After surveying hundreds of kids, Lolleez™ founders determined that traditional flavors like cherry and grape have a negative association that is tied to medicines. My kids would love the strawberry flavor! My tip is to make sure you’re getting enough vitamin D in your system throughout winter (I supplement with D3) to keep the immune system strong, and drink plenty of water each day. I take Vitamin D also – I find it helps me tremendously! My family would love the strawberry flavor best. My kids would like the watermelon flavor! My grandchildren would go nuts for Watermelon ???? My kids would like watermelon. We use a lot of hand sanitizer and get flu shots. Water and water and water. Drink plenty of fluids. YES! Got to flush their little bodies out! I don’t have kids but I’d like the strawberry! My best tip is to drink plenty of liquids, wash hands regularly and take vitamin c during the winter season. The best trick I have is to make sure I have two of everything,from toys to medicine ???? Frequent hand washing and lot’s of vitamin C! I think the Strawberry would be a favorite at my house! My grandkids would love the “watermelon” flavor. Our kids would like the strawberry the best. We take vitamin C and wash our hands all the time. I don’t think they would complain about any of them. I myself would love the orange mango. but really a lollipop!!! who complains about the flavors. lol and my tip to getting through the flu season is stay on top of it and nip it in the bud at the beginning before it gets so bad. We make homemade “chest-rub” with essential oils & coconut oil. Keeps ‘almost’- forever in the fridge. Not as intense as the major brand named stuff and a whole lot healthier too! I know she would LOVE the grape flavor!! I think my kids would most like strawberry. This is a cool product! Best flu tip is to wash your hands often, and not just germx. Wash with hot water and soap. Also, stay home if you are suspecting an illness. Out kids would love the orange flavor. Strawberry would be my sons favorite Lolleez flavor. We take a lot, I mean A LOT of vitamin C. Also, when first feeling like getting sick take a real high dose (if you are able) of vitamin D. I take about 18,000 i.u.s Only do that for two days. Also regularly take probiotics so the gut is healthy. My kids would like strawberry. One of my best tips on staying healthy during cold/flu season, stay hydrated. My tip is: Wipe those carts at the grocery store down with sanitizing wipes. My kids would love strawberry flavor. My kids love cherry and blue rasberry. Lots of hand washing and bleach wipes. Oh those wipes are a must have! I use most of the tips already! I do make sure my hands have been washed often. Watermelon or strawberry would be our favorites! My tips are the standards because they do help. Wash hands with warm/hot water, cough into elbow, don’t share lip balm, eat lots of soup and drink lots of water. The watermelon flavor would be a big hit here! Strawberry would be a big hit at my house! Washing one’s hands often and effectively helps one to get through cold and flu season! Washing hands and teaching my kiddos to wash their hands and keep hands away from face. YES! I am forever telling my daughter to get her fingers out of her mouth! I think the Watermelon flavor would be the favorite because it’s different and pleasant. That being said, the other flavors, Strawberry and Orange Mango sound yummy too! I think it was a great idea to come up with unique flavors because they kids do associate cherry and grape with medicine. The lollipops for sore throats. GENIUS!! RIGHT? I can’t believe no one thought of it sooner! My grandkids would prefer the strawberry flavor. I think they would prefer Strawberry or Watermelon. If you ask my youngest, her answer would just be ‘red’. I am a big fan of Shaklee Defend and Resist during cold and flu season. It’s kept me from catching all sorts of nasty stuff. Also, I drink pure grape juice every day to ward off stomach flu. My little one would strawberry! She’s a huge an of all things strawberry, so this would be perfect! We would love the strawberry flavor. Red isn’t really a flavor lol – did you mean strawberry or watermelon? My kids would love strawberry! Strawberry would be the favorite around here. We make sure to get our flu shots, lots of Vitamin D, and washing our hands at least 46858574 times a day. Haha! HAHA, yes, that much hand washing is necessary with kids! We always do flu shots, too. My son would love the watermelon flavor. Both watermelon and mango blend would be favorites. A few tips..above all keep sick kids home and separated from the rest of family until fever breaks..teach sneeze into elbow..lots talc. I do the water, D3, healthy meals, and plenty of sleep thing all year round. If my throat starts tingling or I get a stuffy nose, I add Vicks vapor rub to my neck and after massaging it in, I wrap a scarf around it. Can be worn day (if you’re not going out) or night. I also put it on the soles of my feet and then put on a pair of socks on them at night before going to bed. Vicks helps me breath better all night long. Any of the flavors would be great, but I think strawberry would be the number one choice! My kid will love strawberry flavor. All children love watermelon and so do I. During cold and flu season, we follow the Jewish mother plan of chicken soup. But in all seriousness, lots of liquid intake, a lot of Vitamin C and Zinc and keep your feet warm and dry. I wash my hands LOTS, drink plenty of water and at the first hint of sick get out the essential oils. Love my oils! We use our diffuser ALL the time! I think the kids in my life would love all of these yummy flavors, but probably Strawberry the best. I think strawberry would go over best. watermelon. we wash hands as SOON as we come in from school! I wish I knew a tip lol. I try to do everything right but we still got sick last week. We keep our hands washed and take elderberry syrup each day. To get through the cold and flu season, bundle up and wash your hands. It’s (usually) worked for me! I think watermelon would be a hit! My tip for staying healthy during this season is to always wear a hat outside (heat escapes from the head after all!) and to not let symptoms fester without doing something! It almost always gets worse. My best tip for getting through cold and flu season is of course prevention. If it does enter your house though try and have a little cold and flu kit ready to go with tissues, and meds and maybe a soothing scent to put into a diffuser if you have one. They would love the strawberry ! I think watermelon would be the favorite but honestly,they would love them all because they sound yummy! Hydrate, hydrate, hydrate. Green tea, chicken broth and good old water. Also, manuka honey, vitamin C and when all else fails…Tylenol! My kids would probably love the strawberry and watermelon flavors although if they had honey lemon flavor they would go for that flavor first. My son would like the strawberry flavor ones. My tip for getting through the cold and flu season is to get plenty of rest, stay away or avoid stress as much as possible, wash hands frequently, take or eat vitamin C every day, stay away from sick people, eat only healthy foods. I think my grandkids would like the Strawberry best. My tip for cold and flu season is to eat a balanced diet where you get a good source of fruits and vegetables and drink lots of water! Watermelon would be the popular flavor in my house! 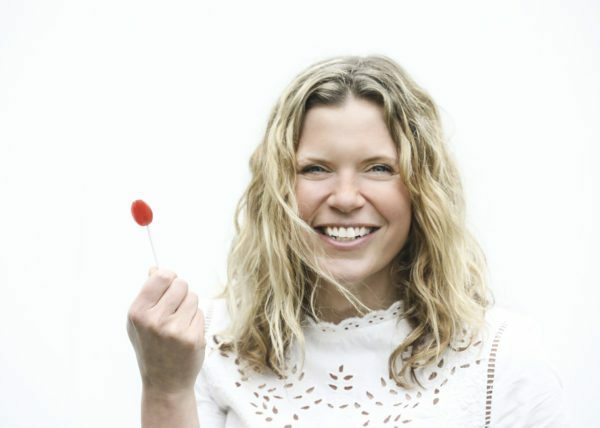 A lollypop is a wonderful idea. I think strawberry would be popular. I drink plenty of orange juice and make sure to take my vitamins. Strawberry would be my niece’s favorite. In cold and flu season we wash our hands very frequently. The Strawberry flavor would be their favorite. I always use an abundance of hand sanitizer for cold and flu season. All the flavors look great, but I think the watermelon would be the first ones to go. Thank you for the chance to win! When I start to feel a cold I automatically boost my vitamin c intake and make sure I keep hydrated. My kids would probably like the strawberry. My tips is to wash your hands and face often also stay away from sick people. My tip for getting through cold and flu season is to disinfect phones, door knobs, faucets, and remote controls every other day of not daily. Strawberry would be the flavor my kids would enjoy. I think I would try strawberry first , but I think my kids would like all 3 flavors! I think all the flavors but maybe strawberry would be the favorite. My tip, likeothers, is to wash hands a lot! My tip for cold season besides washing your hands, like a million times a day is vicks on the bottom of your feet and on your chest. My family would like grape flavor. I love Vicks on the feet, I also find that essential oils on the feet help, too. I like using peppermint or rosemary and lavender at night. I think that my Grandkids would like the Strawberry flavor. Watermelon and strawberry would be the favorites in my house. I think it’s important to get plenty of rest, wash those hands often, and get plenty of fluids! Always wash your hands,especially important to teach kids to do. I make sure everyone washes their hands and plenty of rest and fluids. We have a lot of tissue and hand santizer. I think they would like the strawberry flavor. my kids would love watermelon! This is so smart! It’s a cough drop on a stick! The kids would love the strawberry flavor. The kids so love the watermelon one. We get through cold season with Children’s Advil and lots of soup. No children in my family – my grandson is about to graduate from college. And he doesn’t like honey. Since I dislike lollipops, these wouldn’t interest us. My daughter might like them, but I’ve given up guessing what flavor she’d prefer. My kids would like Orange Mango. I like to stock up on cold and flu supplies. The best tip for getting through cold & flu season is getting everyone on board with constant hand washing! And carry hand sanitizer in your bag for when you’re out & about! Take vitamin C and get a good 7 or more hours sleep. They would like Strawberry the best. And my family would LOVE the watermelon flavor pops! We get through the cold/flu season with cold medicine, cough drops and soup.. Lemon juice, honey, ginger, turmeric. Heat up and drink as a tea. My mom swears by tumeric, thanks for the tip! My grandchildren would like cherry. They love anything orange flavored. My tips for getting through cold and flu season is to get the flu shot, take vitamins daily and use hand sanitizer. Strawberry caught my eye right away! My Son loves strawberries and anything strawberry flavored. Just the color red help too! I don’t have kids at home but do have grands….they would probably like the grape! This is a great idea to help them feel better quicker! Thanks! For me, other than using sanitizer like a psycho, I always dab some vasoline on my Sons nose to prevent chafing from blowing. Vaseline does wonders, doesn’t?? Great tip! The kids would absolutely love the Orange Mango flavor! We take Vitamin C regularly as a preventive measure. My son says “cotton candy” flavor would be the best! Hand washing is best, but for in the car and in my bag for when we’re in a pinch, I use the hand sanitizer lotion from Bath & Body Works. Too much hand sanitizer makes our skin so dry! They would choose watermelon or strawberry. Not sure about the orange mango, they may pass on that one. During the cold and flu season, buy one of the hand sanitizers that are small and have a little gel attachment that you can hang on your purse or their school bags. And constantly ask if they washed their hands so it embeds in their brains to wash their hands. My daughter would love the strawberry. My kids would love the Strawberry! My tip is to wash your hands and take your vitamins! Watermelon would be a huge hit. My little guy will like Strawberry the best! My family get through the cold and flu season by washing our hands frequently, staying stocked up on tissues, and lots of chicken noodle soup! My granddaughter would love the watermelon. I would recommend washing hands frequently. I also think drinking plenty of water, lots of rest and taking a vitamin C once a day is a great idea. I get the flu shot every year. Even though I still catch the flu sometimes, it has never been severe since I’ve been doing that. I get lots of rest, wash my hands frequently and drink a small glass of oj daily. My kids would definitely like the strawberry flavor. I would like to try the Watermelon flavor pop. My kids would probably like the strawberry or watermelon! My nieces would love the watermelon flavor for sure! 🙂 Thanks for the chance! During the cold and flu season, hand cleansing is important as well as good sleep. Also, plenty of liquids and extra Vit C.
A toss up on the favorite flavor would be watermelon and strawberry. Both are equal favorite flavors! My kids would like chery for sure! Hand sanitizer and tissues are what I use to get through cold and flu season. Thank you! My kids would love the Strawberry flavor. Our kids would love the strawberry flavor. My tip is to wash your hands frequently. My son’s flavor preference changes from week to week. He would probably be happy with any fruit flavor. They would like the orange-mango best. Try to get enough sleep, don’t get run down and wash hands often and very thoroughly. All the flavors sound so good, but I will say watermelon!!! I know my daughter would love the strawberry flavor, probably all of them! Lots of water. Eating healthy. And lots of snuggles. My boys would love the Orange Mango!! Strawberry and watermelon would be our choices. I help the kids fight off the winter bugs by making sure they get lots of rest. I can tell when the kids are starting to get sick when they fall asleep in the car easily. Orange Mango would definitely be my grandson’s favorite. Plenty of sleep helps keep you healthy! I dont have kids but I would like strawberry or watermelon. To help with sore throats we use hot tea with lemon and honey. My niece would like the strawberry flavor the most! My tip to get through cold and flu season is to continue to exercise regularly to keep up a good immune system and to not share water bottles. These look awesome! I wish we had these when I was little. I’d take strawberry! We always disenfecting everything and washing things to keep germs to a minimal. Plenty of rest and eating right helps too. They love watermelon flavored candy so they would probably like that flavor the best. My kids would like the strawberry. Oh I think his favorite would be the Watermelon! My tip would be one that we try to do and remember every day….whenever we go out and about…we always wash our hands when we first come back into our home. Try to keep those germs out as much as we can. My tips for getting through cold and flu season are pretty much what everyone tries to do. Get a flu shot, especially if you or someone in your household is in a high-risk group. Wash your hands or use hand sanitizer. Try to keep your immune system healthy by getting enough sleep and watching what you’re eating. And keep your fingers crossed! I like to take Airborne or something similar and wash hands often. I think the Orange Mango would be a favorite. We would love to try the Orange Mango flavor! Disinfect everything in your home, always wash your hands, and always have medicine in case you do get sick. Wash your hands frequently, avoid touching your nose and mouth, drink plenty of fluids and make sure to get enough rest. I don’t have any kids but I think I’d like the strawberry flavor. My favorite tip is plenty of hand sanitizer and chicken noodle soup. I think our favorite flavor would be strawberry. My son would love watermelon. My kids love strawberry flavored! Take lot of zinc, airborne, and vit c.
My kids would like the watermelon flavor best. I think my kids would prefer the Strawberry flavor. My tip is to constantly wash your hands. My daughters are grown now but they are still at home occasionally and sore throats are simply no fun. I have added Loleez to my shopping list and will get the watermelon and strawberry asap to keep on hand in the event they are needed. Oh my boys love anything mango so the orange mango would be our choice!! Sounds so yummy! My tip would be to drink LOTS of water every day and always wash your hands. I think strawberry would be their favorite. My best tip is to wash hands and keep fingers away from eyes,nose and mouth. My kids would love all the flavors but they’d probably reach for strawberry first. I think my grandkids would love the watermelon! My kid would love the watermelon flavor! A tip for flu season is to always wash your hands and stay hydrated with lots of water. 1 Tbs raw honey + 1 tsp cinnamon taken every hour when sick will get you over what you have very quickly. My kids would like the strawberry flavor! My tip is to wash your hands a lot and to drink a lot of fluids to keep hydrated. I don’t know about the kids but my favorite flavor would be the orange mango. My tip would be chicken noodle soup! and my kiddos would love the orange mango flavor. I know mine would love the watermelon flavored ones! Get lots of rest, drink plenty of fluids, take your vitamins and wash your hands frequently to avoid spreading germs. I wash my hands a ton! I also take extra vitamin c! I think Strawberry would be the best! I think my grandchildren would like the watermelon flavor the best. My best tip is to wash your hands all the time, and try to stay away from others who are sick. I wish I had some great tips or magic ways to avoid the dreaded winter sickness…but alas, I really don’t. Just the basics…wash your hands, don’t eat after other people, limit what you touch in public. I can say that I do think zinc works great when you feel a cold coming on. My daughter would like strawberry the best. My daughter would probably definitely like the strawberry flavored one! We also take our vitamins and keep our hands washed! Door knobs are totally a harbor for germs!! Although all of the flavors sound good, I’m fairly certain that the Orange Mango would be the most popular in our house. Orange Mango sounds like a delicious flavor to soothe and comfort sore throats. I tend to have honey to cut down on coughing and help ease throat pain. Plus tea helps to prevent colds by boosting the immune system. I loved the bit on their research for flavors! Watermelon would be the winner!